The Offset Pressman: What is Dot Gain and What Causes It? Dot gain is one of the most discussed variables in offset printing. To accurately produce four color images, dot gain must be controlled. There are many explanations, but I would like to present one in very simple terms before I get into a subject like this in depth. Let's start by answering a couple of simple questions. Lets start with mechanical dot gain. When a dot or any printed image is transferred from one surface to another, some pressure must be applied to perform the transfer. I love the example of potato printing from elementary school. Cut the potato in half and carve an image into the flat surface. Then after coloring that surface with paint, press it onto paper. You just demonstrated dot gain. By pushing that potato onto the paper, you actually increased the size of the image, albeit marginally. This is called mechanical dot gain. The same thing happens with ink in offset printing. 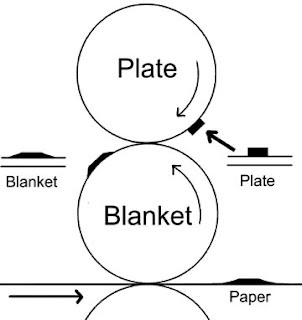 When ink is transferred from a plate to a blanket and then to paper, it gets squished. Now optical dot gain. Objects on the page appear larger than they actually are. This is because there is a slight shadow around the edges of the printed dot. Light is prevented from escaping from underneath the edges of the dot and hence gives the appearance of being slightly larger. It may be very little, but it is enough to alter the appearance of an image. The more dots in an image, the more optical dot gain occurs and the image gets darker. In offset printing, there are a myriad of variables that can affect dot gain and it is my hope to make an entry on as many as I can. For now I will cover to simple factors that contribute to it: quantity of ink applied and its viscosity. It is reasonable, that thicker the film of ink you try to squish to another surface, the larger it will become, hence mechanical dot gain. The illustration shows this. Hence printers are limited in the quantity of ink they can apply. A pressman will try to apply more ink in the hopes of pushing the limits of his color gamut or producing nice sharp images, but will begin to lose out by succumbing to higher dot gain and trapping problems (another entry someday). Add to this a property of printing ink called viscosity - the resistance of an ink to flow. The lower the viscosity of an ink, the more of a tendency it will have to push beyond the limits of where it was originally intended to be applied. 1. Ink and water balance. 2. Blanket construction or other properties. And many, many more. Leave a post of any that you think I've missed.